On a pain scale of one to 10, new shoe blisters probably rank somewhere around a 12. You know when buying any new pair of shoes, it’s important to break them in before taking them on the road. But beyond the simple fact of pain, synthetic cleats in particular need to be broken in to prevent the likelihood of injury on the playing field, as well as to establish a good fit. 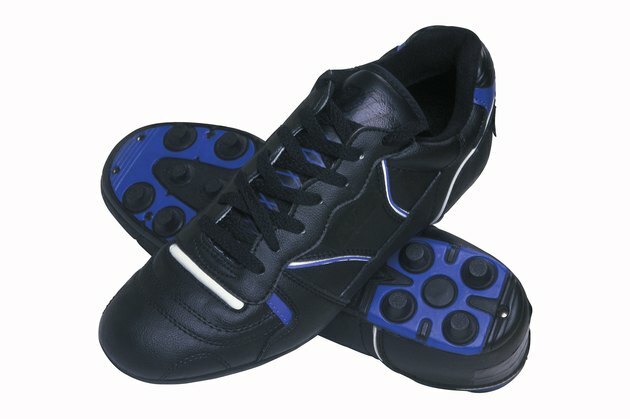 If you play any sport in which you require precise footwork, which covers just about everything but water polo, a pair of well broken-in cleats can help to keep you from muscle pain, blisters and movement restraint. Bringing both new cleats and old cleats to practice is a wise strategy. Wear the new cleats at the beginning, and switch gears with the old cleats if you notice a change in your level of comfort during the game. Don’t jump into the deep end here -- it’s important to move slowly as you get used to the new cleats. You also want to twist and turn the cleats on the practice field a few times in order to help soften the material, which will allow your foot to move with better dexterity than you would otherwise be able to in a stiff shoe. Many pros use use a warm-water technique that allows the synthetic material to expand, giving you some room in the shoe. Put your feet, shoes included, into warm water and wait for about half an hour, letting the shoes dry naturally as you wear them. You can also rub your cleats with petroleum as soon as dry. This will keep the material from splintering down the line, and will keep the exterior of your shoes moisturized. After you wear them, try not to leave your cleats in your bag. Instead, fill the inside of the shoe with balled-up newspaper and place them in a room that has a moderate temperature -- not too hot and not too cold. The newspaper will allow your shoe to keep the shape of your foot, even when your foot is not inside it, and will help to keep the shoe’s interior dry.